This Lithium Ion batter replaces Jet Ski Sea Doo Yamaha WaveRunner Yamaha Jetboat Honda Aquatrax Scarab Jetboat Vortex Jetboat and Polaris PWC batteries model GYZ20H, GYZ20HL, GYZ20L, SYB16L-B, YB16-B, YB16-B-CX, YB16C-B, YB16CL-B YB16HL-A-CX YB16L-A2 YB16L-B YB18-A YTX18L-BS YTX20-BS YTX20H-BS YTX20HL-BS, YTX20L-BS YTX24HL-BS. Extremely light weight, 50% to 70% lather then standard batteries. Built in LED test guage. Fast recharge, can be brought up to a 90% charge within 6 minutes. Long shelf life, up to 1 year before requiring recharging. Easily 6 to 12 times more cycle life compared to lead acid batteries. No hazardous acid or heavy metals, non explosive and non combustible. Fits Kawasaki Jet Si 300JS/TS/SX, 400 JS, 550js 550SX 650SX 650JS X2 750SX 750SXI SS XI XIR ST STS 750 ZXI STX SXI Pro 800 SX-R 900cc ALL 1100cc All 1200CC 99-05 STX12F STX15F Ultra 250X Ultra LX Ultra 260X Ultra 260LX Ultra 300 Ultra 310. Replaces Polaris battery PWC All. 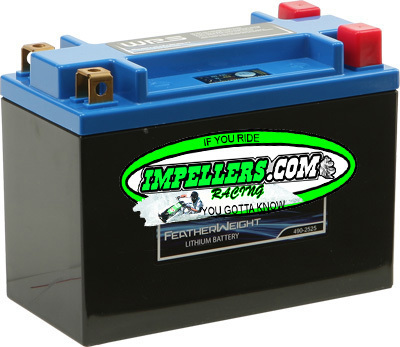 Replaces Honda Aquatrax battery R-12 R-12X F-12 F-12X F-15X & Gpscape. replaces Yamaha Wave Runner battery All.